I got to see the Onyx yesterday, a new CCTV from Freedom Scientific yesterday, and here is a brief review. It is a small camera on an arm mounted to a base, similar to the Eye-stick, Clearnote, etc. Freedom is currently selling four versions, 2 of which I saw. One can be connected to a laptop, the other can be connected to a TV with a composite or s-video cable. The only hardware difference between the two is the little black box that plugs in between the Onyx base and the display. The rep also mentioned they were working on an X-Y table for it, which should cost around $200. Pluses: This device uses the latest in digital video technology, and has a very crisp and clear image. All the controls are on the remote, and can be placed where ever the user can best reach it. Set up appears to be user friendly. 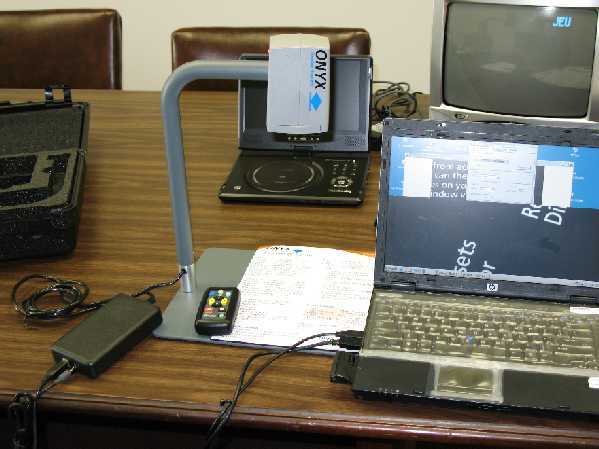 It also comes with Magic screen magnification software, so there is no need to buy another $400 screen magnifier. Minuses: Does not have it's own battery power, so it runs of the laptop. It requires two USB ports on the computer to operate. It can not be connected to both a laptop and monitor/TV for home use as it is currently available. Like all devices that run through USB ports, there is lag between movement and the image on the screen. There are also two more versions which I didn't get to see, the Onyx Deskset 17 (picture reminds me of a Clarity Deskmate, so now I am waiting to see which company comes out with a product call the DeskView) which attaches the swing arm to a 17" LCD monitor, and the Onyx Flex-arm PC Edition, which looks like a Enhanced Vision Acrobat that connects to a laptop.